Randy Baldwin, Horticulturist and General Manager of San Marcos Growers. In some books the Anigozanthos are called "sword-like" or "iris-like" but in fact they are a genus of plants in the Haemodoraceae, a family which is represented by 13 genera, primarily restricted to the southern hemisphere (Lophiloa - a small perennial bog plant is found in the eastern USA). There are 11 species of Anigozanthos, or Kangaroo Paws as they are commonly called, that are restricted to the southwest corner of Western Australia. They are rhizomatous herbaceous perennials with flat strap-shaped leaves that are folded at the midrib. The bird pollinated flowers are tubular and split lengthwise with the 6 lobed "claws" being on the upper side of the flower. Often theses flowers are brilliantly colored and are sometimes clothed by contrasting colored hairs. The name Anigozanthos was assigned by French botanist Jacques de La Billardiere, but it has several possible derivations. Several botanical texts list it as a combination of the Greek words anoigo = to expand and anthos = flower which is in reference to the the flower being split. Other books list the meaning as the combination of the Greek words anisos = unequal and anthos = flower in reference to the irregular corolla. There have been several spellings listed for Anigozanthos including Anigozanthus and Anigosanthos. The genus has also been variously placed in the Amaryllidaceae from time to time by horticultural and botanical texts. Current nomenclature puts the Kangaroo Paws in the Haemodoraceae and has the spelling of the genus as Anigozanthos. Two genera that are closely related to Anigozanthos and grow in the same geographical area are Conostylis and Macropidia. Anigozanthos differs from Conostylis in that it has zygormorphic flowers and differs from Macropidia in its short staminal filaments and multiple ovules per cell. Intergeneric crosses have been attempted between Macropidia and Anigozanthos. Due to their unusual flower structure and striking coloration, the Kangaroo Paws have become desirable to gardeners and horticulturists throughout the world. This interest was first cultivated, as it often was with new and unusual plants, by the English. Louden's Hortus Britanicus, A Catalog of a Plants Endemic, Cultivated or Introduced to Britain, written in 1830, states that in 1808 A. manglesii was introduced by Robert Mangles who had possibly received seed from his brothers in New Holland (Aust). Anigozanthos rufus was introduced into cultivation in 1824. The Royal Horticultural Society Dictionary of Gardening dates of the Botanical Magazine Plates are listed as A. flavida 1808 (BM 1151), A. manglesii 1833 BR, A. pulcherrimus (A. tyrianthinus) 1844 (BM 4507). The first reference of Anigozanthos in the US is made in the 1902 edition of Bailey's Cyclopedia of American Horticulture which lists that "there are 8-10 species of Anigozanthos from Australia for the greenhouse or as half-hardy perennials." Bailey further states that these plants are cultivated in Europe but unknown to the American trade. By the time the 1928 edition of Bailey's was written, Anigozanthos had been upgraded to "Little Known in North America" but both A. flavidus and A. manglesii were listed. Bailey's 1935 Hortus I lists Anigozanthos as an "odd Australian perennial herb with thick rootstocks, linear or sword shaped basal leaves and large red, purple, green or yellowish flowers borne in one sided wooly racemes or spikes, the perianth tube very long", but only A. manglesii is described. Peter Riedel's Plants for Extra-Tropical Regions, which was published after his death in the 1950's, is an incredible work that documents much of the plant introduction work that took place in California around the turn of the 20th century. Although he states that there are few Kangaroo Paws to be found in California, A. manglesii was offered in catalogs in 1911 and again in 1920. He lists Bureau of Plant Introduction numbers for A. manglesii #81671 from 1930, A. flavida BPI #76931 - 1933, again 132069 - 1939 (possibly the red form?). Reidel also states that A. humilis was offered in catalogs in 1920 as was A. viridis. Further introductions of Kangaroo Paws were spurred on by interest in hybrids being created in Australia, and recognition by gardeners and nurseries in California that these plants were attractive and grew well in California gardens. Sunset's Western Garden Book, the barometer of what is an accepted plant in the western garden, lists Anigozanthos for the first time in their 1967 edition. Kangaroo Paws are listed as a garden plant with "striking tubular flowers". The only species commonly grown at this time was A. flavidus. As the Kangaroo Paws became more popular, the search for the better and new cultivar began. For this the gardening public relied on nurserymen who were importing plants and seeds from Australia. Paul Hutchinson, at Tropic World in Escondido, was involved in the production of A. flavidus and A. manglesii from seed in the late 1960's. A neighbor of Mr. Hutchinson, Mr. Fred Meyer, purchased what he considered the best selections from these seedlings to divide and plant out for a cut flower field, from which he was able to produce several thousand cut stems for sale by 1975. Mr. Meyer was also interested in several other species of Anigozanthos and by 1979 was having his best selections of A. rufus and A. pulcherrimus propagated by Oglesby Tissue Culture Lab. Shortly after this time Mr. Meyer introduced me to Kangaroo Paws when I first visited one of his production fields. Later he supplied A. pulcherrimus plants to me for a cut flower field in Santa Barbara. With his interest in Kangaroo Paws it was only natural that he would travel to Western Australia, bringing back with him numerous hybrids, including the first Bush Gems to be cultivated in the US. Some of theses hybrid Kangaroo Paws have also made their way into the nursery trade here. Several hybrids that he brought back were released for sale at the Huntington Gardens annual plant sale in 1985, including a very attractive A. pulcherrimus x flavidus. Mr. Meyer is also responsible for the release of a very good tall pink selection of A. flavidus which has erroneously gone under the name of A. 'Pink Joey' in the California nursery trade. The true A, 'Pink Joey' is a dwarf from of A. flavidus that only more recently was introduced into the United States and is in the Australian Nursery Trade. At San Marcos Growers we are currently producing 6 different Kangaroo Paws and are working on introducing several more later in 1991 (We list 15 in our 2006 catalog). We are grateful to Mr. Fred Meyer for the help that he as given us in this venture and for the plants that he has brought into cultivation. Many other nurseries have had an interest and have introduced Kangaroo Paws into the trade as well. M. Nevin Smith of Wintergreen Nursery has grown more species than any other nursery I have contacted. He currently has in production A. bicolor, A. flavidus, A. humilis, A. rufus, and A. viridis. Daryll Combs, of Daryll's Exotic Plants, in Carpinteria has propagated the Hopper Hybrids and several selections of A. flavidus by division and is currently offering them for sale. El Modeno Gardens Nursery was the first nursery in California to import the Bush Gem hybrids and continue to do so at this time. The Nurseryman's Exchange began marketing the University Series as a florist crop late in 1990. The USDA began a project in 1983 on new Anigozanthos hybrids and research on their cultivation. This project is taking place at the USDA Agricultural Research Service, Florist and Nursery Crops Laboratory in Beltsville, Maryland. The culture and care for many of the Kangaroo Paws is fairly easy if a few of their basic requirements are met. Merv Turner, the hybridizer responsible for the Bush Gem series wrote an article in the August 1986 publication of the Australian publication Gardenscene. He set down the following 5 rules for the cultivation of Kangaroo Paws. Although plants can be established at any time of the year, it is best to plant during the cooler months: either late in the fall or in early spring. If one is planting in a location where medium frosts are expected, protect plants with mulch or wait until spring to plant. A sunny position in the garden is generally best although many of the species and hybrids will grow and bloom in an open light shade. If the location suffers from hard frost, plant in a sunny spot under eaves or under the protection of a tree canopy. Kangaroo Paws do best in, and in fact some will tolerate only well drained soils. A. flavidus, the most common species in cultivation in the US, and parent to most of the common hybrids, tolerates heavier soils than the others, but still responds to more favorable conditions. It is reported that A. manglesii and rufus also will take heavier soils and that all three tolerate seaside conditions. Summer irrigation seems to shorten the life span of Kangaroo Paws, for all species except A. flavidus, yet many of the hybrids will look best if given ample water until the flowering period is over in late summer. Many of the species come from areas of prolonged summer drought and will tolerate similar conditions in cultivation; these species tend to be summer dormant and are easily rotted if given water once in dormancy. For the best production of flowers the cut flower industry in Australia has been advised by their Agricultural Department to drip irrigate on sandy soils daily during the summer. A fertilizer can be supplied through irrigation water. In California, cut flower growers keep stands evenly moist until flowering has finished in fall. In the landscape Kangaroo Paws can be irrigated in a different manner. A. flavidus, A. humilis, A. rufus, A. manglesii and A. pulcherrimus are all species that grow well in dry summer climates. Many of the better hybrids have one or both of these plants as parents and likewise can be treated in a similar manner. These plants can be grown with other Mediterranean climate plants in a dry, or infrequently irrigated garden. It is still advisable to use drip irrigation when irrigation is performed, as this lessens susceptibility to disease. Flower initiation and bloom quality is best with healthy well irrigated plants. The Western Australian Department of Agriculture has noted that irrigated plants tend to flower on the average 1 month earlier than native stands. Flowering time can also be dependent on the planting time and method of propagation. Plants propagated from seed may take several years to flower where as division propagated plants will flower the first season. Plants propagated by tissue culture often will initiate flowering 6 months after planting the first year and will flower at the normal time the following season. By far the most common and damaging problem involved in the cultivation of Kangaroo Paws is the dreaded Ink Spot Disease or Ink Disease as it is often referred to. It is thought to be the fungus Alternaria alternata. Ink Disease causes the blackening of the leaves and flower stems starting close to the leaf tip and progressing down to the rhizome. For some plants such as A. flavidus the disease appears to cause only cosmetic problems. It can be fatal to species such as A. manglesii and A. pulcherrimus. Prevention of Ink Disease is difficult since this fungi has air borne spores which are spread worldwide but by giving ample spacing for good air flow, the chance of infection can be reduced. Certain nutrient deficiencies, especially Calcium and Potassium can increase a plant's susceptibility and physical damage to the leaves caused by human contact, frosts or by pests such as snails and slugs can increase the chance of infection. Heavy soils, humid conditions or heavy shade can also make plants more susceptible to this disease. It should be noted that many of theses causal agents can produce symptoms that both resemble and enhance the disease. If a blackening of the stem is noticed, look at it carefully to see if the pitting caused goes all the way through the leaf. Watch for the blackening to spread down the stem and rogue out badly infested plants. Several fungicides have been suggested to control Ink disease. Kangaroo Paws can be affected by a number of other diseases, including a rust fungus on the leaves and root and stem diseases such as Phytophthora , Pythium and Fusarium. Plants are more susceptible to these diseases when under stress. Use of certain fungicides may control these diseases. The most important animal pest to keep off of Kangaroo Paws is the European Brown Garden Snail. Besides eating leaf and flower parts, this snail can make plants more susceptible to disease. Aphids can become a problem in spring and fall but are easily controlled by washing them off the foliage or by the use of soaps or insecticides. Nitrogen - Plants produce pale green leaves; few fans are produced. Phosphorus (rare) - The older leaves of a plant develop an orange-yellow color and die back. Phosphorus toxicity is more common (especially evident in A. pulcherrimus and Macropedia) ; it appears like Ink Disease with blackened tips that gradually progress down the leaf blade. Potassium - The deficiency symptoms appear on the oldest leaves. The tips die and may be accompanied by brown spots on the outer half of the leaf. Plants are poorly anchored and topple when in flower. Magnesium - Plants develop a blue black discoloration on the upper half of the older leaves which progressively works its way down, creating a mass of dead leaves. There are three standard methods of propagation for the production of Kangaroo Paws. The oldest and sometimes most simple propagation method of some species is from seed. For some, division propagation is suitable, especially for the A. flavidus varieties and hybrids. More recently, micro-propagation (tissue culture) is becoming a preferred method of propagation for many of the new hybrids as it allows for the rapid multiplication of plants and it is suitable for some members of the genus which are difficult to divide and, or, germinate. These three methods are briefly described below. Hot water - Place seeds in vials in a constant temperature water bath 130 -140º F for 1-2 hours (increase % for all but A. flavidus. Refrigeration - Store seeds in moist peat moss 2-3 weeks in a refrigerator prior to sowing. After germination, care should be taken as seedlings are susceptible to damping off and should be sprayed with a suitable fungicide. Alternatively, sow sparsely, provide good air circulation, water in the late morning so foliage will dry rapidly and plant out seedlings when young. Division can be done either in the fall after flowering or in the early spring. Although fall is recommended in many Australian texts, we have found that divisions of A. flavidus and its hybrids do best in early spring. Split rhizomes with a sharp knife and clean off all old foliage. Protect newly divided plants by potting into a shaded location for at least several weeks so plants can recover from being divided. This has become one of the most promising methods of propagation for many plants including Anigozanthos and Macropedia. Many of the new hybrids becoming available have been propagated by tissue culture, both in Australia and by companies here in the United States. The basis of tissue culture propagation is the isolation and growing of a small portion of plant tissue in sterile controlled conditions on a nutrient agar medium. Since there has been no contact with soil, disease, or pests, tissue culture plants can be shipped relatively easily, even across international borders. After the plants have arrived at their destination the plants are lifted out and the agar is then washed off of the small plants in tepid water prior to potting into cell trays or liners. A low level of hormone application applied to those plants lacking root development has been shown to result in a 95% or better survival and establishment rate. A soil mix of 50/50 peat to perlite is a suitable potting mix at this stage, with an optimum pH of around 5.8. At this early stage, plants should not be allowed to dry out. Use of intermittent mist in a greenhouse without cross drafts or the use of an anti-transpirants is recommended as are periodic fungicidal drenches to prevent damping off. After approximately 4 weeks plants should be sufficiently hardened off to allow light levels and ventilation to be increased. At about 8 weeks plants are ready to be planted into a 6 inch or 1 gallon container. In the mid 1970's, Dr. Stephen Hopper began crossing different species of Anigozanthos at the Western Australian Wildlife Research Centre in Wanneroo, WA. His primary interest was not to produce plants for horticulture, but to study the phylogenetic relationships between the different species. Some of these crosses turned out to have horticultural value and were tissue cultured by Dr. Jenny McComb, of Murdoch University. The came into cultivation in the US in the early 1980's because of their value in the cut flower industry. Although some of these plants trickled into the nursery trade early on, they only became widely available by the efforts of Twyford Plant Laboratories in Santa Paula, CA. With the ability to mass produce Anigozanthos through tissue culture, Hoppers three hybrids, A. 'Red Cross', A. 'Dwarf Delight' and A. 'Regal Claw' were soon spread around to many nurseries in southern California. In the mid 1980's, work was being done on the hybridizing of Anigozanthos for the horticultural industry. By this time there were quite a few Kangaroo Paws on the market. An article in the July 1986 issue of Australian Horticulture states that "Over the past 2 years or so, the market has been swamped by wave upon wave of new Kangaroo Paws and more often than not, confusion has reigned supreme." Keith Oliver, at Lakkari Native Plant Nursery was working on a breeding program to produce good quality ornamental plants. He produced several hybrids in the Australian plant market, including A. 'Early Spring', A. 'Big Red', A. 'Emerald Glow' and A. 'Harmony'. Of these I am only aware of A. 'Harmony' having been reported cultivation in the US [Big Red is now in the US trade - RB/2003]. All of these plants showed hybrid vigor but unfortunately were still susceptible to Ink Disease. 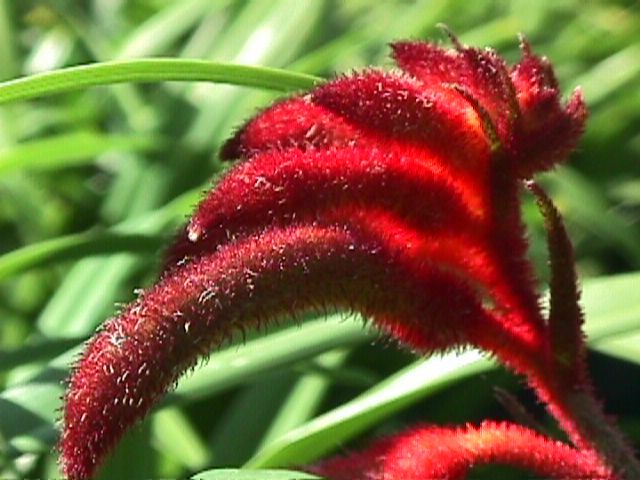 If the problems with Ink Disease could be dealt with, the Kangaroo Paws would have greater potential in the cut flower and nursery industry. For this reason plant breeder, Professor Merv Turner of Monbulk, Victoria embarked on a program to cross different species and then test their susceptibility to Ink Disease. He spent more than 10 years developing his hybrid Kangaroo Paws, first by careful selection and breeding and then by exposing young plants to diseased stock. The survivors were retained for breeding purposes and the weak were culled out. When released March of 1986, they were the first hybrids to be bred for disease resistance and were called the Bush Gems. These hybrids are recognizable for the name "Bush" or "Gem" in their cultivar name. Professor Turner continued work on his hybridizing program for only 2 years after the initial release before he died. At the time of his death his plants were being marketed by Biotech Plants Ltd., a joint venture between Bush Gems Nursery, in Vitro Australis (a tissue culture laboratory operated by Angus Stuart) and Biotech. For several years the breeding project suffered but recently Ngarie Turner (Merv's wife) has finished cataloging and documenting the diverse collection of mother stock available for future breeding; over the last 2 years further hybrid crosses aiming at plants suited to the landscaping/flowering pot plant market have been made. Through work with this breeding line and working on a new program that will combine laboratory based procedures (mutation breeding, embryo rescue, seed germination, tissue culture propagation and manipulation of ploidy levels to restore fertility to sterile hybrids.) Biotech estimates that they will be able to do in 2 years what took 7 or more years before. El Modeno Gardens Nursery has been marketing Bush Gems to the nursery trade for since 1998 and San Marcos Growers will begin production and marketing of this line of plants for late summer and fall of 1991. Several of the Bush Gems are protected by a non-propagation agreement and by International and US Patents held by Biotech Plants LTD/ Biotech has also introduced plants called the University Series, which were primarily the work of Angus Stuart. These plants are being marketed by the Nurseryman's Exchange and are showing up in chain stores across California. There are 11 species of Anigozanthos, all of which are endemic to the southwest corner of Western Australia. Within the genus, there are two species groups which are differentiated by the tendency of the inflorescence to branch or not. The following list is separated into these two groups. It gives a general description of each species and what hybrids can be attributed to it. To 6 ft. tall and flowering in a range of colors from yellow, pink to red. A. flavidus is the most common of all of the Kangaroo Paws in cultivation. It is also the toughest; able to take wet conditions, heavier soils, full sun to light shade and is resistant to disease. For this reason it is often a parent of many of the better hybrids. Some very good selections such as A. flavidus 'Red' and 'Pink' (misnamed 'Pink Joey' in the trade) are available and the species has been used to create hybrids such as A. 'Red Cross', A. 'Regal Claw', A. 'Dwarf Delight', A. 'Bush Dawn', A. 'Bush Haze', A. 'Bush Ruby', A. 'Bush Noon', A. 'Bush Ranger', A. 'Bush Nugget', A. 'Bush Glow', and A. 'Bush Baby'. A very attractive species with brilliant golden yellow flowers on reddish flower stems. Requires very good drainage and full sun. This species is very susceptible to ink spot but is a good co-parent to A. flavidus in producing showy hardy yellow strains. Among the earliest of the hybrid Kangaroo Paws to enter the U.S. market was an exceptional plant which has not been given a showy name; it simply goes by its parentage and is called Anigozanthos pulcherrimus x flavidus. Other cultivars within this line include A. 'Harmony', A. 'Bush Noon', A. 'Bush Dawn', and A. 'Bush Haze'. A low growing Kangaroo Paws that has only recently been described and is virtually unknown in cultivation. The specific name onycis is from the Greek word onyx which means claw and refers to the claw-like appearance of the open flowers. The flowers can be red or yellow suffused with red and differs from A. humilis by having a branched inflorescence. It is noted to be one of the most floriferous species in the wild, which has resulted in its inclusion in the hybridizing efforts that created such notable plants as A. 'Dwarf Delight' and A. 'Bush Magic'. A. rufus - Red Kangaroo Paw - A showy species with deep red flowers. A. rufus tolerates moderate frosts and a wider range of soils than other Kangaroo Paws. Plants of this species have been cultivated in California, where it has grown beautifully but proved to be been short lived. Its susceptibility to Ink Disease and its attractiveness to snails has been noted in Australia; this has been dealt with by crossing with A. flavidus, producing notable hybrids, such as A. 'Red Cross', A. 'Bush Ruby' and A. 'Bush Sunset'. Similar to A. manglesii but with smaller stature and flowers. Tolerates winter wet moisture if drainage is adequate. This species can be severely damaged by frost. It has been used to create A. 'Emerald Gem', A. 'Bush Opal' and A. 'Bush Nugget'. A species not in cultivation in the U.S. and was considered up until 20 years ago a subspecies of bicolor (A. bicolor var. minor). As this species is even smaller than the Little Kangaroo Paw (A. bicolor), it is mostly suited to the rock garden. It reportedly has a propensity to flower and can be a very attractive sight. An attractive, small Kangaroo Paw, growing yellow to orange. Although it has proven to be short lived in cultivation, A. humilis has been an essential ingredient in the Bush Gem plants, 'Bush Nugget', 'Bush Gold', 'Bush Glow' and 'Bush Flame'. A very attractive small red flowering plant which has close ties to A. humilis. It has proven difficult to propagate and grow, which has led to its absence in cultivation. This spectacular plant is the floral emblem of Western Australia. The combination of red hairs that clothe the stems and flower bases with the green perianth and reflexed petals makes for a slightly unreal effect. It is certainly worth cultivating even given the cultural problems one may experience. Although susceptible to the dreaded Ink Disease, this plant's life span can be increased by good cultural practices such as good drainage, good air circulation, drip irrigation (as opposed to overhead), snail and slug control, and clump division every 2-3 years. Even so, it is rare to find clumps of this plant more that a year or two old. A. manglesii is a parent to A. 'Bush Emerald' and A. 'Emerald Gem'. This Kangaroo Paw has the largest individual flowers of the genus, with the orange to red flowers held above the foliage in an unbranched inflorescence. Although more tolerant of wetter soils than most other Kangaroo Paws and listed as long lived in the wild, A. preissii is listed as difficult to maintain in cultivation. Its slender upright flower stems, with the flowers clustered toward the top has made it a good parent for the cut flower variety A. 'Regal Claw'. A small, emerald-green flowering Kangaroo Paw with fine deep green leaves. This Kangaroo Paw comes from an area that can very wet in the winter and so is less particular about soil drainage. It has been used in hybridizing work to create A. 'Bush Magic' and A. 'Bush Emerald'. A cross between A. onycis and A. flavidus with a multiple branching inflorescence, 2-3 ft. tall. It bears red flower buds, which turn to orange and apricot as the flower opens. A strong, long -blooming hybrid. This is the earliest of the Kangaroo Paws to bloom and it continues well into the summer. A. 'Dwarf Delight' has pollen that is not completely sterile and therefore, has potential in future breeding. A. 'Red Cross' - A vigorous hybrid between A. rufus and A. flavidus, has spectacular, tall (4-5 ft.), multi-branched stems with rich burgundy coloration on both flowers and stems. The flowers open to reveal a green interior. A good strong grower, it blooms a little later than A. 'Dwarf Delight' and continues on into late summer. A very attractive, tall hybrid between A. preissii and A. flavidus with thin olive green leaves and erect clusters of large, double-headed, flowers. It is one of the few inter-specific hybrids to have a high pollen fertility, making it possible to use this plant for further breeding. A small hybrid between A. humilis and A. flavidus, it grows to 18 in. tall and has branched flower stems holding pale orange flowers that are tinged burgundy at the tips. A good container or rock garden plant which holds flower color well. A striking hybrid between A. manglesii and A. viridis with 2 ft. unbranched red stems and emerald green flowers. The foliage of this plant is a grey-green color. An early blooming hybrid. A tall upright hybrid between A. pulcherrimus and A. flavidus with bright yellow flowers tinted green. A good cut flowering plant with a long bloom period. A compact flowering and branching hybrid between A. humilis and A. flavidus with double ranked golden flowers with red bases along a bronzy-red stem. A strong growing polyploid with a more complex lineage than most. This plant is a cross between A. humilis x flavidus x humilis x bicolor. It's 2-3 ft. red flower stems are branched and have yellow flowers. Flowering commences in early spring and continues through summer. An outstanding hybrid between A. humilis and A. flavidus with bright red flowers on branched 18 in. stems. One of the most popular of the Bush Gems.